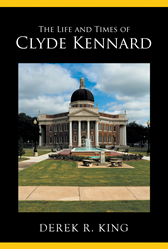 “The Life and Times of Clyde Kennard” by Derek R. King is a biography on the forgotten history of Clyde Kennard, a man who used his desire for education to challenge institutionalized segregation in Mississippi after being denied admission. King’s book details the compelling story of Kennard’s attempt to enter Mississippi state while placed in the context of key events in the civil rights movement. Many view Kennard’s attempt to enroll at Mississippi State College (now the University of Southern Mississippi) as the first serious attempt to integrate any public school at the college or higher level in Mississippi. King spent over 10 years conducting research for the book on Clyde Kennard and accumulated over 100 books related to the project, in addition to periodicals from the 1950s-1960s and newspaper articles from Mississippi. “I approached Derek King's book on my client Clyde Kennard with skepticism. Could a white Scottish man be entrusted with the story of an unsung hero of the Mississippi Civil Rights Movement? Yes, King's book is a revelation.” —Steven A. Drizin, Clinical Professor of Law, Northwestern University Pritzker School of Law in Chicago and the lawyer who helped exonerate Kennard. Although Kennard’s struggles were overshadowed by James Meredith’s admission to the University of Mississippi, his story is an uplifting and inspiring example of perseverance, hardship, and committed determination to right wrongs and his legacy lives on through numerous recognition initiatives including the Kennard Washington Hall at Southern Miss to the Kennard Scholars Program. To learn more, please visit http://www.clydekennardlifeandtimesof.com. Derek R. King spent over 10 years conducting research for “The Life and Times of Clyde Kennard” and 16 years overall studying and researching civil rights struggles and the reaction to them in Mississippi between 1954-1964. He is married and currently lives in Scotland. King can be followed on Twitter @DerekRKing2.